There’s a lot of charm in these old buildings. Love the fact you can stay in an old train car. The Choo Choo has been steadily getting out of the hotel business to become strictly an event venue. The staff was wonderful. Old facility in need of upgrading. Way past due. Pleasant staff, impressive architecture. I love the convenience of location. My husband enjoyed the train room. It could definitely use some updates but the experience overall was great and what I expected. Not sure if there is a way to make it more soundproof from outside noise but that would be my only big negative. Awesome experience for anyone who loves trains, historical buildings, or something a little different than typical hotels. Staying in a train car is a must, and they were bigger, more comfortable, and more adorable than we had hoped! These are very cozy accommodations that you'll never forget---plus free wifi (with a strong signal, even in the Pullman cars); perfect central downtown location; amazing architecture and history; great assortment of free games for the whole family set up outdoors; attached coffee shop, restaurant, bar, and souvenir store; heated indoor pool on the premise; and lots of parking. The rooms were well-furnished with a comfy queen bed plus a daybed (with a trundle underneath), desk, chair, lamps, tv, mini-fridge & coffee-maker, and a shockingly big bathroom (with a built-in heater)! 100% recommend staying at this historic location when in Chattanooga, we loved every minute of it from playing bocce in the evening among the lighted gas lamps to enjoying the beautiful gardens/fountains to snuggling down in a real train car. You are paying for nostalgia. That being said, it was pretty cool staying on the train car. Front desk was like pulling teeth. Understand that upkeep on old train cars is not easy, but management really needs to look at the damage. Fun hotel with a great train theme. We didn't stay in one of the train car rooms, but our room was clean and comfortable. The hotel grounds are very pleasing with fountains and games set up all around. There are some stores and restaurants on site as well. The hotel is a very close walk to a lot of bars and restaurants. Unique venue. We went for a wedding anniversary only 30 minutes from home. Hotel has lots going on. We went to the Comedy Catch on site, a couple of bars also. There was a Brewer's Fest going on with food trucks in the court yard, lots of other on site dinning and attractions. An all inclusive stay without leaving the site. Lots more varied dining and attractions within walking distance. Chattanooga itself is a great place to visit. Great stay. This place has so much potential. Great location, the grounds and facilities are definitely on the way up. We stayed in one of the train cars. You are paying for the experience of staying in a train car only. The room itself was clean but in need of repair. I understand that it is historic but the bathroom was a joke. Not a complete waste, my wife and I had a great time, just not worth the price. Chattanooga Choo Choo by no stretch of logic should be thought of as an historic hotel. It is a crumbling Motel 6 from the late 1970's behind a very nice historic train station. My family was locked out of our room twice due to faulty locks. The whole place smelled of mildew and the overpowering chlorine smell seeping past the "fire door" (with a broken lock) from the pool. There are a few new fixtures to give the mild appearance of an update, but this is still very much a sow's ear. Charged for parking.Pool is supposed to be heated but is ice cold.Poll needs to be resurfaced,as it gives the impression of being dirty.You need to give a warning on the amount of the room tax as it may be better to choose a less expensive hotel. 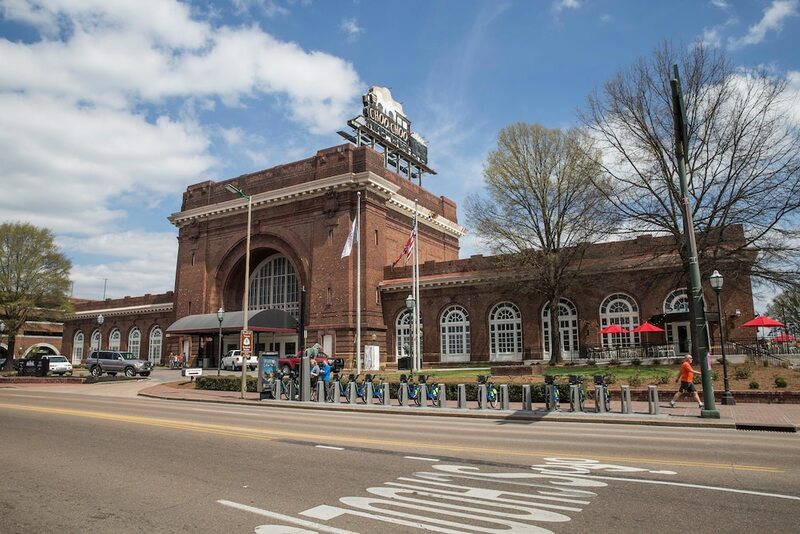 Located in Downtown Chattanooga, Chattanooga Choo Choo is adjacent to Songbirds Guitar Museum and within a 15-minute walk of popular sights like Chattanooga Market. This 145-room, 3-star hotel welcomes guests with 3 restaurants, an indoor pool, and a 24-hour fitness center. This hotel is home to 3 onsite restaurants, perfect for a quick bite to eat. You can sip a beverage at the coffee shop/café. A TV comes with satellite channels, and guests can stay connected with free WiFi. The bathroom offers hair dryers and free toiletries. Other standard amenities include a coffee maker, free weekday newspapers, and an ironing board. At Chattanooga Choo Choo, guests enjoy features like an indoor pool, a 24-hour fitness center, and free WiFi in public areas. If you drive, self parking is USD 7 per night, and there's also a free area shuttle. The front desk is staffed 24 hours a day to help with dry cleaning/laundry and concierge services. Other amenities at this boutique hotel include a business center, a microwave in a common area, and express check-out. Thank you for sharing your feedback. We're glad you enjoyed your stay with us, and that we were able to get the issue with your keys resolved quickly. Thank you for sharing your feedback. We're glad you enjoyed your stay with us. Thank you for sharing your feedback. We sincerely apologize for the inconveniences you experienced while staying with us, and we hope to see you once the train car renovations are complete. Thank you for sharing your feedback. We're glad you enjoyed your stay with us, and we apologize for any inconveniences you experienced. Thank you for sharing your feedback. We are glad you enjoyed your stay with us. Thank you for sharing your feedback. We're glad you had a wonderful stay, and we apologize for any confusion. We are working hard to be a one stop hotel with rooms, restaurants, concert venues, and more. Thank you for sharing your feedback. We apologize for the inconveniences you experienced while staying with us. Thank you for sharing your feedback. We're glad you enjoyed your stay. Thank you for sharing your feedback. We sincerely apologize for any inconveniences you experienced while with us. Thank you for sharing your feedback. We're glad you enjoyed your stay with us. We apologize for the noise coming inside the train cars from the outside. Stir - Restaurant open daily for lunch and dinner. Kid's menu available. Recreation features at Chattanooga Choo Choo include an indoor pool and a 24-hour fitness center. Children under 18 years old are not allowed in the swimming pool without adult supervision. The preferred airport is Chattanooga, TN (CHA-Chattanooga Metropolitan): 18-min drive, 12.9 mi/20.8 km. The following credit cards are accepted: American Express, Diners Club, Discover, JCB International, Mastercard, and Visa. This property only accepts debit or credit cards for all onsite payments. Cash is not accepted.